What is Goosefoot Bursitis of the Knee? A bursa is a small fluid-filled sac found between soft tissues and bones. It lubricates and acts as a cushion to decrease friction between bones when they move. Bursitis refers to the inflammation and swelling of the bursa. 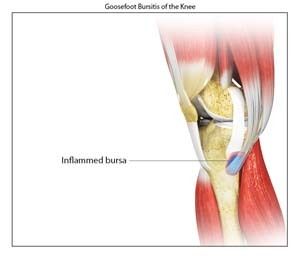 Goosefoot bursitis or pes anserine bursitis is the inflammation of the bursa present between the tendons of the hamstring muscle and the tibia (shinbone) on the inner side of the knee. Goosefoot bursitis is often caused due to repetitive friction on the bursa, overuse of the joints during sports, osteoarthritis of the knee, obesity, medial meniscus tear, tight hamstring muscles and incorrect training techniques. The primary symptom of goosefoot bursitis is pain on the inner side of the knee and/or on the center of the tibia, which may worsen with physical activity. 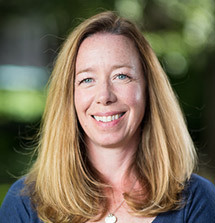 When you present to the clinic with these symptoms, your doctor diagnoses goosefoot bursitis by ruling out other conditions with a thorough physical examination of your knee and X-ray imaging studies. Goosefoot bursitis can be effectively treated with conservative therapy including rest, use of ice packs, anti-inflammatory drugs and injection of steroids at the region of the inflamed bursa to relieve inflammation and pain, and physical exercise to help improve range of motion at the affected region. Surgery is performed only when conservative treatment is ineffective, and involves the removal of the bursa.